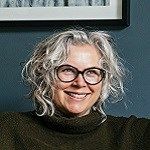 Kate Watson-Smyth is the go-to girl for interiors advice, whether it be where to pick up a vintage classic to choosing the perfect shade of grey for your latest design project. Top interiors magazines regularly showcase Kate’s own eclectic London home, and now we chat to Kate about her distinctive Urban Glamour style. She explains the inspiration behind the unique design she’s created for us and shares her expert tips on how to get an Urban Glamour look in your home. Kate, tell us about the design process behind your roomset? I knew I wanted simple blinds to show off the windows to their best advantage and when I saw the material came in Millenial Pink I knew it was the starting point. I wanted luxurious materials, lots of texture, metallics to throw light around and then some wit – the palm tree light – as well as lots of greenery. Can you describe what Urban Glamour means to you? It’s luxe with a bit of an edge to it. No one element defines this look, everything works together so you can’t pull out the separate elements. It’s about colours and textures, and how you combine them. What do you love about the finished roomset? I love the colours – charcoal, blush pink with flashes of brass and greenery. It sums up my style perfectly. Why did you choose this Roman blind fabric for your design? I like the clean, uncluttered look of blinds. They work together with a window and show it off. I had never thought of using this colour as a window dressing before but as soon as I saw it I knew it would be great. It’s a much more considered neutral than white or grey. It will be warmer in the evening when pulled down under an electric light and look cool during the day when it’s barely visible but just a little more interesting. What tips would you give to anyone choosing window dressings for their home? Remember, your window is a big part of the room. It probably takes up the most of one wall so you need to consider how it will look from the start. Then you need to integrate it with the rest of your space. In this case I matched the window frames to the wall colour to bring it all together. The blinds contrast beautifully with the charcoal colour and the pink is picked up in the cushions. You don’t want it all to be matchy-matchy but do make sure there is a link between all the pieces in some way. I’m a journalist by trade but after my elder son was born I went freelance and started writing features about property and interiors. It grew from there. I set the blog up five years ago and I’m now writing my second book. What’s the best piece of style advice you’ve ever been given? Finally, what one design tip would you give to a design novice? Think about who is using the room and what for. You need to design for the people who actually live there and not that fantasy family from the telly that lives in perpetual sunshine and smiles. If you hate cooking, don’t design a kitchen around a massive range cooker. Design for a better version of who you actually are, not who you think you want to be. This look treads the fine line between glamour and grunge, elegance and anarchy. A modern look incorporating charcoal and blush pink with flashes of brass and greeny - it’s luxe but with a bit of an edge.